It stands to reason that the world leader in lead trimming technology would manufacture the world’s best cutter rings. Q Corporation originated smooth edge carbide cutters for guaranteed shock free trimming. And, to assure longer life between resharpenings, we perfected our own carbide mix of tungsten and cobalt based materials. Manufactured from our own proprietary carbide mix of tungsten and cobalt materials, Q-Cutters are fired in vacuum sintering furnaces, ground with diamond wheels on rigid machinery, polished, and submitted to two independent inspections for guaranteed results. Q-Cutters are fired in vacuum sintering furnaces programmed for temperature versus time, for guaranteed results. Our carbide cutters are hard and grinding is a test of man and machine. Our skilled grinders use diamond wheels and rigid machinery to prevent vibration and possible damage to the final cutting edge. Skill and great care are required to prevent microfracturing of the cutting edge. Microfracturing is microscopic cracks between the cobalt eutectic and the tungsten carbide causing premature breakdown of the cutter edge. 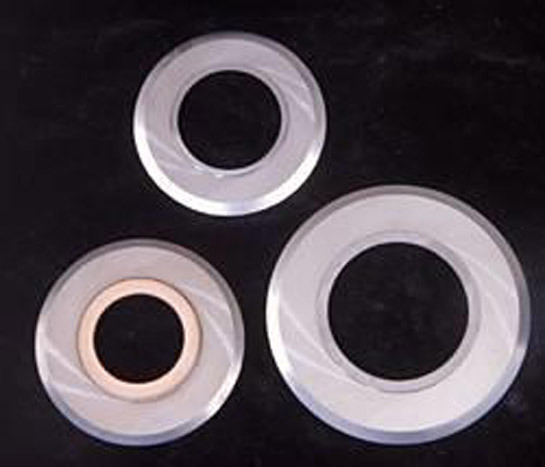 Specification, quality, and consistency of dimensional tolerance is assured by a minimum of two independent inspections of each cutter ring. Cutter rings are shipped with complete lot documentation. Q-Cutter quality is the highest in the industry. They are precision manufactured to deliver the quality critical for trimming higher density boards. We are one of the few manufacturers with a warranty written in plain, easy to read language: “If it breaks, Q will fix it – guaranteed”.